1. Preheat the oven to 140°C, gas mark 1. Line 3 large flat baking trays with baking parchment. 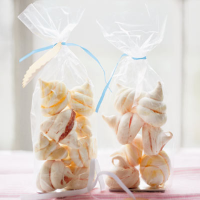 Take 3 Cooks' Homebaking Piping Bags and snip the end off each bag to create a 11⁄2cm diameter opening. Using a clean, wet paintbrush, paint lines of undiluted food colouring along the inside of each bag, being generous so the colours are bold. Wash the brush well in between each colour. 2. Place the egg whites into a large clean bowl and whisk with an electric handheld whisk to form soft peaks. Slowly add the sugar a tablespoon at a time, whisking continuously until you have a thick, glossy meringue. 3. Divide the meringue into 3 bowls and fold through the flavourings separately into each: lemon zest, orange zest and ground pistachio. Spoon each meringue flavour into its corresponding coloured piping bag (yellow = lemon, red = orange, green = pistachio). 4. Pipe one meringue flavour per baking tray. Hold the piping bag vertically about 2cm above the tray and apply even pressure, lifting the bag as you go to make a smooth, round meringue about 3cm in diameter. To finish with a nice peak, push down a little then quickly whip the bag away to form a point. Continue until all the meringue is used — depending on their size, you should have about 25 of each flavour. 5. Bake for 30 minutes, swapping the trays over during cooking so each one has some time at the top for even cooking. Turn the oven off and leave the meringues until completely cool. Once cool, place into gift bags and tie with pretty ribbon.